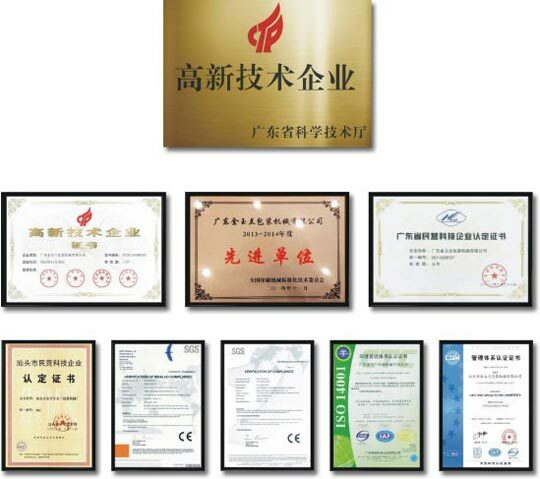 Passed the authentication of "Excellent Private Science and Technology Enterprise of Shantou City"
Won the title of "Guangdong High-Tech Enterprise"
Passed the authentication of "ISO9001：2000 Quality Management System." From 2008 to 2014, Magnolia was named "Big Taxpayer" for six years in a row. Passed the authentication of "National High-Tech Enterprise"
Magnolia was approved to set up "Research and Development Center for Specialty Printing Equipment Engineering Technology in Shantou City"
Magnolia was approved by the Intellectual Property Office of Shantou City as an "Intellectual Property Advantage Enterprise". Won the title of "top ten new brands" of LeKai Huaguang Cup. Passed the authentication of "Private Science and Technology Enterprise of Guangdong Province"
Magnolia became one of members of "All-China Federation of Industry and Commerce, Chinese Folk Chamber of Commerce". Won the title of "Guangdong High-Tech Enterprise". Magnolia became one of members of the "Printing Chamber of Commerce of Jinping District"
Magnolia became one of members of the "Patent Protection Association of Shantou City"
Magnolia won the title of "Intellectual Property Advantage Enterprise of Guangdong Province"
Magnolia won the title of "Science and Technology Advanced Company of Jinping District, Shantou City"
Magnolia was named "2013-2014 Advanced Company" by National Printing Machinery Standardization. Magnolia won the title of "Vice Chairman Company of Industrial Design Association of Shantou City"
Magnolia was evaluated as "Class A taxpayer" in the Guangdong Provincial Tax Credit Rating list. Magnolia won the title of "Guangdong High-Tech Enterprise".